A spay surgery is technically called an ovariohysterectomy and is performed on female dogs and cats. During a spay surgery, the surgeon removes both ovaries and the entire uterus. Notice the normal reproductive tract anatomy pictured to the left. Although it is labeled as canine, the feline reproductive tract appears the same. After anesthesia is administered, the pet is laid on the surgery table with the belly facing upward. The surgery area is shaved of hair and prepared with antiseptic. An incision is made through the skin and abdominal wall in order to enter the belly. This incision may vary in length depending on the size of the pet. The uterus is located deep within the body. The ovaries are attached to the inside of the body wall (near the kidneys) by ligaments and large blood vessels. These ligaments must be stretched or broken down so that the large blood vessels can be tied off (ligated) with sutures. Multiple ligations may be necessary depending on the size of the pet, the amount of fat present, and if the pet is "in heat". After each ovary is disconnected from the body wall, the uterus near the cervix is ligated as well. Now the entire uterus and ovaries can be removed and the body wall incision can be closed. Closure occurs in two to three layers. First, the body wall (musculature) is closed in one row of suture. Then, the subcutaneous fat layer and skin will be closed. Depending on surgeon preference, sutures to close the skin may be placed underneath the surface (which will dissolve on their own) or will be clearly visible on the outside (will need to be removed 10 to 14 days after surgery). Your veterinarian should instruct you on how to take care of your pet after surgery. It is vital that you restrict your pet's activity level for 2 weeks after surgery so that your pet doesn't tear its stitches out. Your pet will not know to restrict herself, so please keep your pet on a leash and do not allow any unsupervised time outdoors. Your veterinarian should also have supplied post-operative pain relievers. While pets do not often show pain in the same way that we do, they will heal faster and more comfortably with pain relief. You should monitor your pet's incision for redness or discharge and report any concerns to your veterinarian. Do NOT allow your pet to lick her incision! You may need an Elizabethan collar ("cone") if your pet tries to lick. Spay surgery, just like any other medical procedure, does come with potential risks and you should discuss these in detail with your veterinarian. 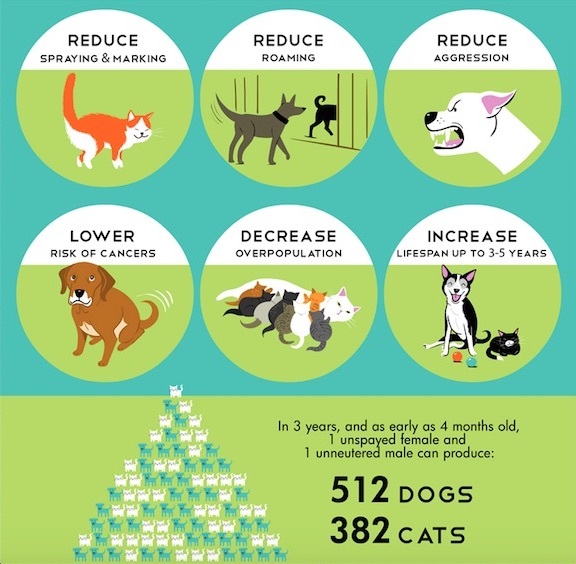 The benefits of spay surgery are many. 1) Spay surgery eliminates the risk of ovarian and uterine cancer. 3) If a pet is spayed before the first heat cycle, your pet has a less than 1% chance of developing breast cancer. (If spayed after one heat cycle, your pet has an 8% chance of developing breast cancer. If spayed after two heat cycles, the risk of breast cancer increases to 26%. After two years, spay offers no protection from breast cancer development. 4) Spay prevents unwanted pregnancies. An unfortunate reality: more than 4 million pets are euthanized in the United States animal shelters each year simply because they have no home. Many are puppies and kittens less than 6 months of age. Help stop this needless loss of life by preventing unwanted pregnancies! 5) Spay surgery has many behavioral benefits as well: for example, spayed animals are much less likely to roam (decreasing risk of loss). Unfortunately, there are many myths surrounding spayed pets. Please talk to your veterinarian about your concerns. 1) Spay surgery does NOT cause laziness or hyperactivity. Spay surgery will not change your pet's innate personality. 2) Spay surgery does NOT make your pet fat. A pet's body weight has much more to do with the amount of calories she is fed and the amount of exercise allowed. 3) Pets do NOT need to experience a heat cycle or birth prior to being spayed. Spayed animals do NOT feel a void in their life if they never raise a litter. 4) Spay does NOT change a pet's drive to hunt or protect their family- this is part of your pet's natural personality.